Learners are always kept up-to-date with what they’ve done and need to do still -- with absolutely certainty! 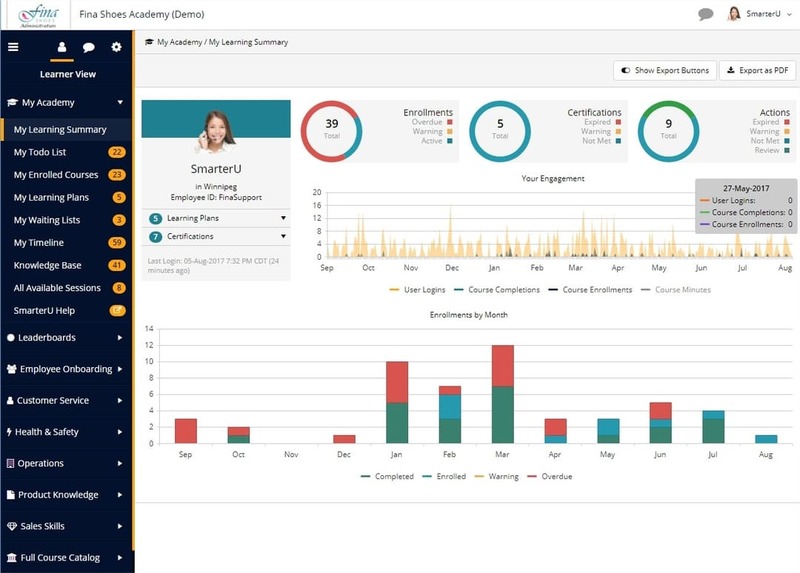 Learners can see a summary of their enrollments, certification, and actions by status, and view their monthly engagements and enrollments - all colour coded so you know their statuses every time you log in. Each learner can keep private, printable notes as they progress through their online learning courses. Give your learner access to a library of courses, and allow them to self-enroll for designated courses. When you assign a course to your learner, you have the option of alerting them with a customized email message. Create a custom email to congratulate your learners upon successful course completion. We’ve made sure every screen is intuitive and optimized to fit every device. Our traffic light reports provides at-a-glance status of assignments, courses, instructors, and users. You have the ability to decide whether a course has a specific due date (i.e. 30 days after assignment). Allow select learners to provide you with immediate feedback as they progress through a course. Option to set a due date – either a specific date or a number of days. Plus, nudge your learners with automatic reminders. Define a learning plan with course or credential prerequisites. You can control access to your courses by restricting the number of IP addresses, which can be used by an individual learner to access a course. Celebrate your learner’s success with a branded, printable certificate that reflects their accomplishment. Our intuitive interface makes it easy for both admins and learners to learn SmarterU effortlessly. Learners complete their web-based training with confidence. Who said a learning management system had to be hard to use? We use everyday terms and plain language. Why complicate? 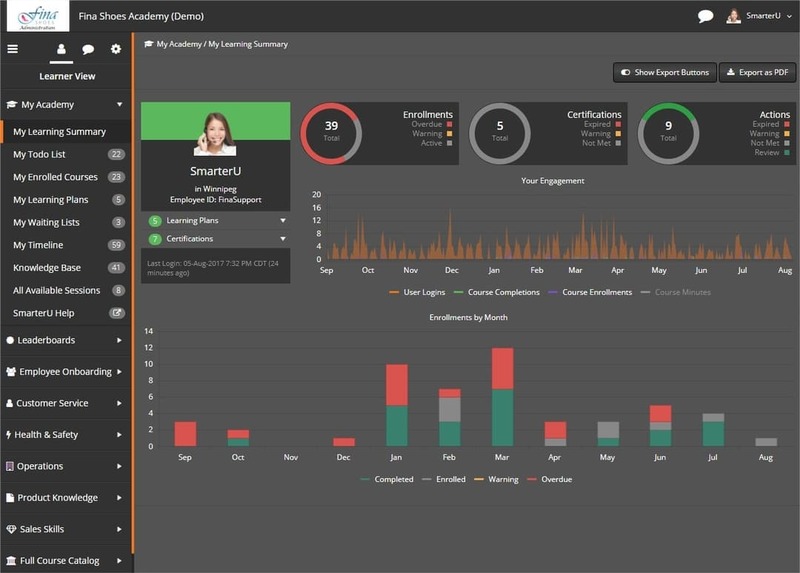 Design the perfect dashboards for your learners. Our learner dashboard is right at home on any size screen. Over ten languages supported – plus more can be added on demand. "The customer service is exceptional, and the tool is so user friendly. SmarterU listens to their clients feedback and is always improving the functionality of this great tool to make the client experience even better!" "SmarterU has a user friendly and effective interface." "For end-users, I feel like the interface is great, the experience is easy and there are little to no problems. As an Admin, the reporting is great and performing the items I need are usually routine. When I need extra help to perform a task, support is quick to reply with an answer that solves my question(s)." Allow your brand to shine. Brand your login page, account theme and completion certificates – SmarterU adapts to you. Have multiple brands? Our linked accounts support multiple brands – with a single login. 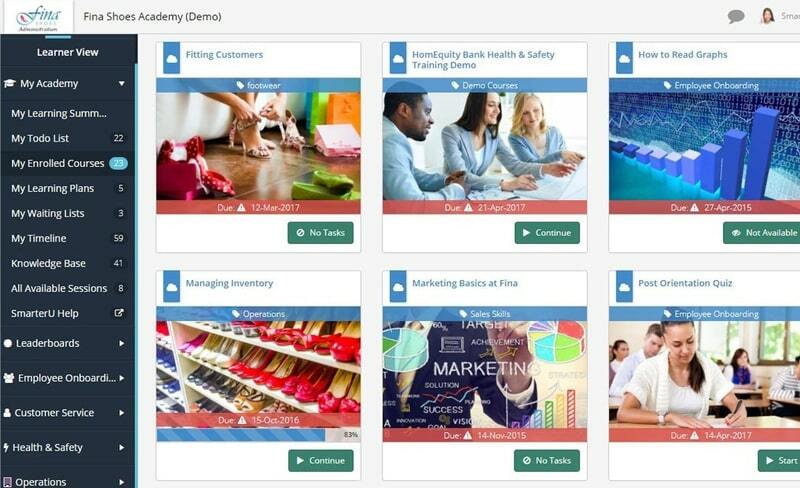 Over 6,000 "ready-to-launch" courses on dozens of subject areas! Encourage social interaction and meaningful discussions when it comes to learning. Our LMS allows for learners to participate in course discussion forums -- direct interactions that bring a whole new dimension to the SmarterU experience. It’s your house of learning; use your own address such as learn.yourdomain.com. Everyone deserves a beautiful front door - don’t you? Brand every page with your logo. Choose a standard theme or customize one. Celebrate the success of your learners with a beautifully designed certificate.